Here is the beginnings of a comprehensive timeline of key events in the history of TEAM. 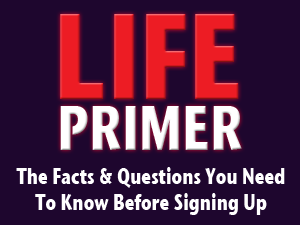 It is currently focused on the bankruptcy cases for TEAM/LIFE Round Table members, the Hubers, Cullens and Darkangelos, and the strategic real estate default of Policy Council Member George Guzzardo. TEAM/LIFE members, including founder Orrin Woodward, have left an incredible paper trail by which we’re able to show how their rhetoric contradicts their actions. As is perfectly evident in the timeline, the Hubers, Cullens, and Darkangelos were showing the plan and praising the financial opportunity of MonaVie at the exact moment when they were going through personal bankruptcy. If you would like to participate in the timeline, leave a comment below. Every item in the timeline must be verified to be factually accurate, either through a link to a post (by TEAM/LIFE members) or a screenshot (if the post was taken down). That timeline format is awesome, Amthrax. So much to add to this. I love your bankruptcy focus. It shows a definite intent to deceive their members. This is a great start. Thanks for throwing this together. Perhaps you can start “charging” for viewing and using that “tool”…we can “promote it for you…..ONLY…$365 dolla….and if you think you can’t afford it then we know you NEED it..haha! The great thing about the timeline tool is that it’s completely free. Free?!!! NO WAY….don’t tell the followers…we can make a killing!!! Great things happen when you leverage the power of the internet 🙂 Thanks to everyone that helped make this!! Does anyone know when this video was taken? There are snippets of Orrin Woodward waxing poetic about Quixtar. I’d like to get the year of this video to incorporate into the timeline (and juxtapose it when Orrin calls Amway/Quixtar a pyramid scheme). Watch the beginning and skip to the 6:55 mark. the snippit of Orrin was taken from a “Quixtar Live” event held in Grand Rapids, MI. I believe this was the 2nd Quixtar Live event. The first Quixtar live was more like an expo with tons and tons of vendor booths. The 2nd one, had a few Amway product booths with more focus on the convention speeches. I’m 99% certain this was the 2nd QLive event. Also, notice how Orrin keeps looking at his notes and doesn’t walk around like normal. I could be wrong, but I’d be willing to bet, he had to get his talk approved by quixtar and was forced to keep to his notes. I think this would have been around 2006-2007. I think Scott Larsen did an article on his site after this speech called “Paddle Your Canoe” or maybe there was a parody on Youtube. But I recall somewhere online people were joking about the Paddle Your Canoe bit. Have regained my critical thinking I find it downright scary and cult like that video is from 6:50 on is. I love how smooth the slides run together. Having regained my critical thinking I find it downright scary how cult like this video is at the end. How is that relatable? I agree with this going at the top permanently just above the bankruptcies because it covers both. I’ve stickied the post to the top of the blog. @Amthrax: did I miss something? Where’s the stuff in the initial blog topic where my favorite little weasel, D. Hawkins gets the favoritism and Raquel etal lose their lives under Guzzardo? (You know, when all of the schenanigans was going on during the transition phase and moving leg members, etc.) Like I said, I might have missed something? @ageofwisdom51 – what are you talking about? Are you referring to no mention of the Hawkins in the timeline? This is just the start for the timeline. We’ll be adding much more in the future (or have separate ones to catalog other people’s stories). Amthrax: yes, I was referring to that. Oh, okay, it’s not done. Got it. I personally went to Berean baptist church. For any who aren’t familiar, this is where it all started. Orrin Woodward and Chris Brady were deacons at this church. I have talked to former higher ups, people who were very close to Orrin. I have heard stories, like churches being split right down the middle because of team and life. Like lives being ruined. Like couples getting divorced. Like people losing their life savings, losing their retirement, losing their homes. I had 2 books recommended to me, which are EXCELLENT books not only for people contemplating joining a MLM, but also people who have gotten out. Consumed by success, and All that glitters is not God. Both by Athena Dean. Excellent books and are available through amazon. I wanted to take the time to say thank you! Not only to this site and the people that run it, but also to all of you who have been able to break free and regain control of your lives. I personally have never joined a MLM nor will I ever, but I thank God for the wisdom to see it for what it really is. I pray all of you stand your ground, share with your friends, share with your family the truth behind team and life. It will come crashing down on them eventually, one way or another. And on that day I will rejoice. Big Thanks to you for sharing! I like the chart and timeline. However, the Cullens would not have joined until after 2001; they were downline to me. I think it would have been in 2001 or 2002, I am betting on early 2002 or mid 2002. They definetly joined after the name was Quixtar, because one of the key aspects of showing the plan as taught by Team Deception was to say it was not Amway, but Quixtar. This email based upon my opinons and observations. Can anyone confirm the start date for the Cullens (joining Amway/Quixtar)? We have one person saying they got their start in 1998 and another staying they started in 2001-2002. For now, I have updated the date in the timeline to 2001-2002. 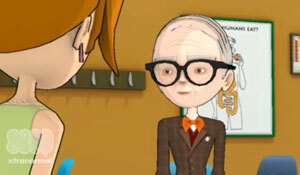 Does anyone know when Orrin first gave the Lungbusters talk? Raquel – still in MonaVie and being paid for the efforts of Randy Haugen, Mark Crawford, Lance Smith, Tyler Libby, Billy Florence and thousands of others who are with MonaVie but not with Team. However, since Orrin did his re-arranging, these people were placed under Owen in MonaVie. The whole group should have been placed under Billy Florence & Randy Haugen. How much of TEAM is still purchasing MonaVie? I can see how they are making money off of the Legacy group (Haugen, Crawford, etc. ), but I would like to know how many within TEAM are still on auto-ship. I can’t imagine the percentage being 100%. 50%? 25%? How much volume is going through the Legacy group up to Orrin? Enough to keep him at Presidential Black Diamond month after month? In my personal MV tree, 12 out of 21 people are still on autoship. But I know for a fact, most of those 12 aren’t even involved with team anymore – I think they just like the product, so they stayed on autoship. Interesting though, it used to be with MV, whoever was above you was your sponsor, so even if you personally sponsored someone, the credit went to the person directly above them. For instance, if the tree was David then Jesse, and David signed up Henry, Henry’s sponsor would have been Jesse, since Jesse is directly above Henry. But now, my sponsor is actually the person it’s supposed to be – it has changed – and I went through my downline and most of them are what they should be. I find this interesting that it was changed. Also the last person sponsored in my downline was from 2010, so I don’t think they are actively promoting Mona Vie. We now have less than 30 people still on autoship from TEAMscam after having well over 2,000 people go through that binary in the last 4 years. Almost all the Teamscammers have turned off their autoship. I can’t believe MonaVie doesn’t realize this. They still think Owen is doing a lot of volume. But the highest percent of autoship leaders are Haugen, Florence, Crawford, etc – not the Life/Team people. I think the lawsuit from EB should be added to the timeline if possible. Even if nothing comes from it the lawsuit shows just how far the “leaders” will go to shut people up. On this site dissenting opinion is allowed unlike the “leaders” blogs. 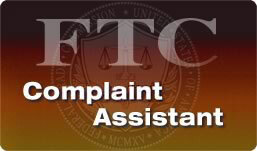 2) the truth statement meant to assist others in avoiding financial ruin, and again, only a hypothetical example: “when I was in _______business, EB contacted his upline __________and together they decided to take these persons from my own distributorship downline:_________, ________, “(and so forth). The “truth statement” does not libel the person whom one is talking about, i.e., does not attempt to assassinate character and cause harm—libel is written and happens without the person who’s being talked about direct permission to do so. And it’s a matter of judicial interpretation of the law as to the motive of the person making statement #2 above, too. In addition, If Raquel can prove parts of EB’s own blog about her to be untruthful, then she, too, has a counter-case—one does not have to swear or make jokes in committing libel–if anything he wrote is untrue, it casts a pall over the blog in general, and it defames her directly. If he was serious here, his duty was to contact her directly, through a lawyer first, to ask her to “cease and desist” (this is usual and customary) and not commit his own public flogging, committing the very offense he, himself is in an uproar about. ( I find it hilarious that Kristen Seidl, of all people, commented on that blog–talk about a completely “all in” LIFE/Teamer). 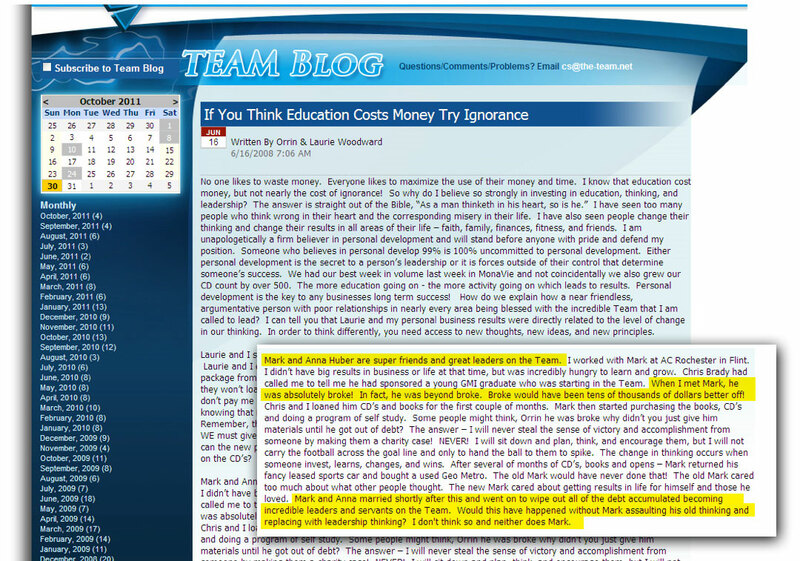 This blog was put up without Raquel’s knowledge or consent, and it sole intent was to discredit her. If there are ANY untruths in it, it’s defamation. I need your help. Some information, please. I just had my last phone call with Mark Paul (for those who don’t know him, he is the uplink leader of Chuck Cullen and Joe Darkangelo). He called me in response to a “not so nice….how could you” text I sent him. he told me I had bad information, and I was only getting YOUR side of the truth. This is what he told me. 2) He says that our Timeline is wrong. He says that once Team found out that Cullen & Darkangelo declared bankruptcy, they were pulled from the Team speaking circuit. I know that Amthrax took Chuck & Joes Open speaking schedule off the Team site, but that doesn’t mean they actually spoke. Does anyone have notes from any of those opens immediately following the declaration of bankruptcy that they wouldn’t mind scanning for the Timeline to confirm that Chuck or Joe really did speak from a Team stage? That would be awesome. Cullens filed for bankruptcy on March 16. 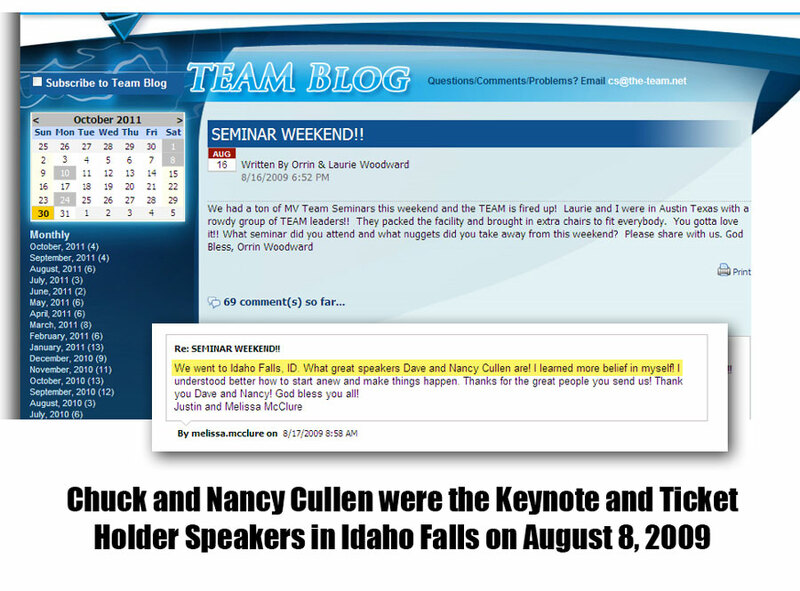 They are confirmed to have spoken at Idaho Falls on August 8 (TEAM Calendar) and by this comment on the TEAM Blog. The commenter got Chuck’s name wrong (called him Dave), but got Nancy’s name right. 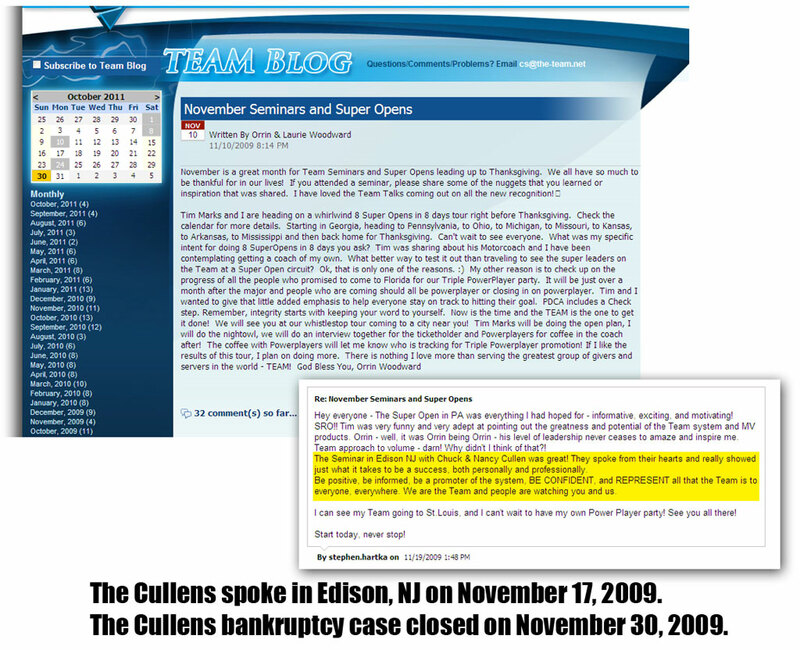 Cullen’s bankruptcy case closed on November 30, 2009. Here we have a comment saying they spoke at a Super Open in Edison, NJ (presumably on Tuesday, November 17, 2009 Correction: Monthly Seminar was on Sunday, November 8, 2009). Guess Orrin and TEAM didn’t know at that point either, did they? Rascal- I think the biggest breakthrough is that we have a huge “leader” on the Team specifically mention this blog. Oh that’s smokin’ hot, Amthrax….smokin’ hot. Love the second one. My what a tangled web we weave when at first we try to deceive. My wife seems to think, Mark was talking to me directly with that council comment, but I think he was just throwing Joe D. under the bus. Either way, my 15 yr old son tries the same line of crap when he gets busted……Deny…deny….deny….blame….blame…..change the subject……all in that order. So thankful I am done with him for good. He didn’t take responsibility for his team and take the fall for them. Instead he blamed them. That makes him a coward and a false leader. Too bad. I actually trusted him. Honestly I smoked him out with a text. He didn’t respond to the blog. If I were him, I would just let you believe that. But I’m not him. Just as I was saying to myself, “Ah, Mr. Paul, your silence is all the proof I need,” he called. What I ended up getting was even better than silence. I will add that Mark said, he never reads this site, and he’s never been here. I don’t buy that, but I don’t really care. It doesn’t matter. I’m not here to bring Mark Paul down. He’s going to do that on his own. You can only throw your leaders under the bus so many times before they start throwing back. I’m just here to save the next person from him…..period. If he happens to go down with the rest of them, please God, don’t judge me too harshly if I do an end zone sack dance in my living room. Orrin’s quote about the Hubers comes on June 16, 2008. The Hubers have been in TEAM since around 1997-1998. The Hubers filed for bankruptcy in October, 2010. The facts simply DO NOT add up. You don’t go bankrupt (the way outlined in the documents) overnight; it takes years and years of financial mistakes to get to the point where you have to declare bankruptcy. I know what Joe D & Cullen were doing. Actually the following is just my opinion. Maybe that’s what Mark Paul meant when he said, “some people don’t take council.” Maybe he did know their finances and suggested the best thing they could do was find another job and hold off on Team until they get some extra cash? I don’t believe I could actually type that last paragraph with a straight face. I don’t believe for a second that these leaders didn’t now about the financial troubles of the people they were putting on stage to bleat stories about personal success. But even if they didn’t truly know about the financial troubles and bankruptcies, the leaders still have to shoulder the blame for the failure to properly vet these people. In other words, it was their responsibility to know the backgrounds of the people they put on stage, and because they didn’t, they failed as leaders. The truth of the mater is that reality and honesty don’t matter at all to the leaders. All they want are obedient marionettes who will go on stage, read the script, and do whatever dirty work is necessary to fleece the audience. It’s well documented that Monavie’s Jason Lyons put a child molester on stage — Lou Niles — to pretend to be a medical doctor and convince the audience that Monavie could cure cancer. Fortunately Niles’ is currently in a federal prison and his sales pitches will now be limited to bargaining with vengeful inmates for his life. I never heard any defense from the Lyons’, but is there any doubt that it would be an insincere plea of ignorance? There’s certainly no shortage of cautionary tales when it comes to TEAM/Monavie leaders giving the stage to hypocrites, liars, criminals, and those who are morally (and financially) bankrupt. Hi Melanie. I’ve enjoyed your posts very much. Thank you for helping to keep people informed. Melanie, OMG, no! How did I miss that? I just pulled up the new entry about the lawsuit and will read it now. Grrr…I’m seething already. I meant “Raquel” nor “Melanie” in paragraph 2…sorry. OK, we’re in the Timeline thread. Help me fill in the WTH happened here? I get in Nov 2006. We see that Orrin talks about the Walmart Of The Internet in June 07. We get booted in from Amway in Aug 07. Jan 08, my Turbo 25 goes to Tim Marks’ house, while some other big leaders go to Orrin’s house. They see a catalogue of products….The NEW business. Everyone’s fired up. I heard about a catalogue, but not much more than that. We have a major in St. Louis in Feb, but nothing is said about Walmart. The word I got was that we couldn’t because of a pending court case muzzling the leaders. When the heck did that get shot down, and when did the Round Tables get let in that it wasn’t going to happen? Did you guys know as soon as Orrin introduced the benchmarking study, or was it when he announced MV? And what the heck was that Phase I and Phase II roll out stuff with Monavie and partner stores that I was hearing about in March 08? I was lead to believe we were going in one side and out the other side of MV to start the Walmart biz. Then I was of the understanding that we would be building it with Monavie. LOL…every time MV made a change to the MV Mall, I was awaiting the Team announcement. Kinda freakish, isn’t it? Mark Paul told you he had no idea the Cullen’s or Darkangelo’s were in financial trouble. WHAT A BUNCH OF CRAP!!! He knew full well that they, along with several others on his team, were in big trouble. HE WAS IN BIG TROUBLE HIMSELF!! He told several people that he didn’t know how long he could stay in his house on Lake Angeles because his income was so bad. Mark Paul, this is what I have to say to you: liar, liar, pants on fire. I was going through my iCal Calendar the other day….looking back at the time of the bankruptcies. You won’t believe what it says on Sept 2, 2009, and how it plays into the time line. I’ll let you guys draw your own conclusions. This was a plan for the entire Paul team. Keep in mind, 14 days later Joe declared bankruptcy. I had a new guy who backed out on me an hour before we were supposed to leave, or I’d have been there. This was the only time Bill had ever done a plan that I had access to. Note: The Trackback #3 is a link to a critic of this site. His post argues that the visual timeline actually demonstrates the income potential of TEAM. Geez thought these guys had the lifestyle of the rich and infamous, steadfast almost made me want to file for bankruptcy he glorified it so much, with all those rich and famous people including those Team Liefers. Gotta love the Trump (4 times) bankruptcy but yet is a billionaire still? Does anyone else see there is something wrong with that picture? Steadfast almost made it sound like everyone goes bankruptcy. Yep, gotta love it these guys can even go bankrupt like the rest world, and still be hero’s… but wait a minute… they always said they weren’t like the rest of the (losers) in the world…Again…which is it? Wow. Does anyone know if steadfast is a Christian? Wisdom~ I think you might want to read mr. anti-amthrax site apparently you are a star in one of his post….he wrote just about you! I look forward to your response. “Steadfast” (as he anonymously calls himself)…he seems a little angry…and also he acts like he doesn’t like Amthrax….Why is that..hmmm…. It seems like he is what Orrin calls an internet hater and he is anonymous to boot! Wonder if he knows Qrush? I am totally disgusted and ashamed we were ever a part of or had anything to do with the Woodwards, George and some of the Team members. Reading the Qrush Blog and knowing this is who Orrin is…wow.. makes it even more appalling and disturbing and imo very sick. Wow does he put on a front! First off people are choosing to NOT see what is right in front of them, just shows how they are letting him control them, including the PC and how do they continue to listen to someone like the man behind Qrush? Secondly he has grossly breached the trust of so many people and those left following can’t even see they are controlled and ignore all he has done? Have the followers read Orrin’s words on his Qrush blog? How does he or ANYONE else stand on stage promote this guy behind Qrush and claim he is a Christian, leader, guru, man of integrity, honest, etc, etc…? Wow, we were around them for 13 years…man is he a faker. and pretender.. it almost seems as if he has a split personality and to think we thought we knew him or called them friends!? Unbelievable…How does Laurie live with this? She accepts this or denial or just pretending or has she read the Qrush blog? What will his kids think of him after they read his words on the Qrush blog? After everything he has done and all he self proclaims about himself…holy cow… I cannot believe that anyone would follow him anywhere! It seems extremely bizarre to me now that the PC could continue and all the little followers do not SEE through this! IMO, they are Either completely brainwashed or greedy or both. How do they fake it? Pretend, have Bible studies, church services, stand on stages talking about God? It is just twisted to me looking back and knowing what they have done… Are they conscienceless or is it eating them alive? They are under some serious undue influence, it shows everyone has the same responses (cannot think for themselves, they just repeat, the same old stuff). You can also see they are the “nicey-nice” all so “positive” people in their attacks, they are pretenders! I am so very glad we are FREE from them all! should say: they AREN’T the nicey nice…. Hope someday for the sake of some of the followers they wake up! Amthrax- Maybe the “Amthrax- Review” site just forgot to allow comments. I bet that’s it, right? “edited for clarity” or edited to suit what you want to say…………..you are the bullsh*****ters! TEAM AND LIFE are AWESOME. Hannah- While I’ve got you here I was hoping that you could answer a simple question for me. What percentage of your Team is making a profit? Hannah- Follow up question for you. Do you think that I would be able to make the same comment on a PC’s blog if I did not agree with what they had to say, or would I be censored? Hannah – you are correct – I’m in total AWE of TEAM. Just when I think they couldn’t fall further down my respectability list, they pull another bonehead move and take another tumble. I don’t think they’ve hit bottom yet, but I’m banking on the fact they eventually will. Private actions reap public consequences…their day is coming! To all: Maybe I am asking the question in a confusing way. It is not possible that every single TEAM LIEF member that comes on here would avoid the question. It must be on my end. When I ask “What percentage of their Team is making a profit?” it has to be written in invisible ink. I highly doubt that they would just refuse to answer a straightforward and important question about their business. Amthax- I might have missed it, but I believe the “3 Million Dollar Loan” from MV to OW is missing from the timeline. @freedomhaha – I’ve added a reference to the $3,000,000 loan in the timeline. Set it to around 2/14/2008 as a estimated time. Linked to the original Salt Lake Tribune article and added the relevant quote. Undoubtedly a definitive definition of MLM scams. Case closed! Did Melanie already share or she is yet to? I would love to hear what she found as well because it will no doubt help many people become free of this cult. i saw just a few minutes ago on facebook that the hubers will be moving in three days to live in port st lucie. im just wondering if they have to live by orrin or chris in order to survive since we saw how much they really make. kinda makes you wonder about things. but i love the first comment on their post about it someone asked if they are moving because of a job? i think we could look into that. I know the they ar set ill pushing monavie products in the new LIEF flagship as to how hard I am not sure I was offered some through my friend. Apparently they must still be trying to get people to sell it. She could’ve never paid for any, so I am assuming her upline gave it to her. This was around Christmas 2012. I wonder how hard they are pushing the product. Timeline updated: Orrin calls the summer leadership convention “the best one yet” via his blog. Do we have a running list of best ones yet? Amthax- A possible blog addition I have been thinking about is having a section of the blog that shows the PC houses/cars/RVs, ect. so that 99% of TEAM can directly see where their money is going. You never know what will be the breaking point for someone to free them. A former TEAMmate of mine posted a quote by Jordan Belfast (aka wolf of Wallstreet) yesterday by accident . I couldn’t help but think how when I watched that movie he reminded me so much of Orrin Woodward. I hope he gets caught the same way really. @LionChaser – What did the quote say? Did he delete the quote afterwards?